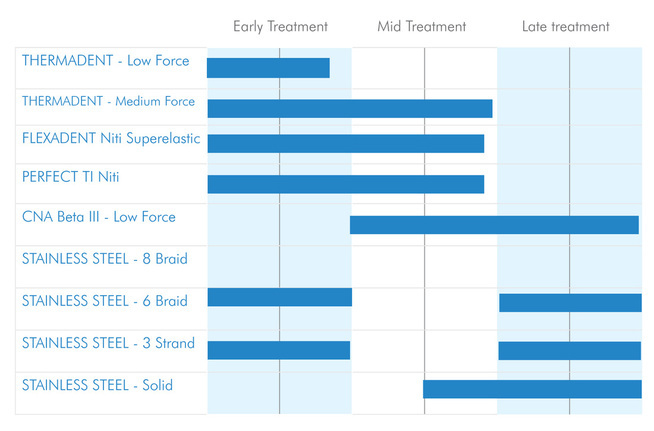 FLEXADENT™ - Ideal for alignment and leveling in early to mid-stages of treatment. All NiTi wires exhibit a unique “Superelastic” behavior. • Light to moderate, consistent forces. • Near consistent force over a long activation period. • Greater patient comfort over Stainless Steel wires. • Excellent resiliency, resulting in high resistance to permanent set. • Leveling, torque, and rotation can be addressed simultaneously early in treatment. No need to treat each of these individually, as is the case if using Stainless Steel wires. In addition, Nickel Titanium wire may also demonstrate a heat-activated "Shape Memory" effect produced through a tightly controlled manufacturing process. THERMADENT™ Heat Activated wires are shape memory, heat-activated wires. • Superb flexibility at room temperature, allowing for even easier ligation. Soft in the hand. • Very responsive to chilling. • Gentle forces are initiated by intraoral heat and remain consistent throughout treatment. • Noticeably more comfortable for the patient due to low forces. • Allows for patient to control discomfort with cold water rinses. The characteristics of our custom designed, nickel-free Beta III Titanium wire make this perfect for use in mid- to late stages of treatment where space closure, rotation, and proper molar relationship are the goal. • Nickel-free! Eliminates treatment concern of nickel sensitivity in patients. • Excellent formability allows easy fabrication of loops and bends for space closure and tooth movement. • Easily accepts 1st and 2nd order bends for tipping and aligning. • Very good resiliency as compared to Stainless Steel. • Approximately half the tooth-moving force of Stainless Steel. • CNA Beta III significantly outperforms TMA Beta III and easily accepts 1st and 2nd order bends without breaking issues. Our archwires are manufactured from medical grade 304V Stainless Steel material (70% Fe, 19% Cr, 9% Ni, 1.5% Mn, 0.5% Si). These archwires can be used throughout treatment but are best suited for mid - to late stages of treatment. • Higher force and limited resiliency as compared with Beta III CNA™ wire. • Forces drop quickly; best suited as a finishing wire. • Greater patient discomfort when used in early treatment stages. • TWISTADENT™ 3-strand (twisted) wire provides moderate forces and limited flexibility. • TWISTADENT™ Coax (6-strand) wire provides lighter to moderate forces and slightly better resiliency than 3-strand. • TWISTADENT™ 8-Braid wire provides the lightest forces of the multi-strand Stainless Steel wires, with relatively good resiliency.